MK107 MOD 1-M: 3.51 lbs. MK107 MOD 2-M: 3.63 lbs. When you’re ready to leave behind the wear and reliability issues of traditional gas-operated direct impingement systems, Primary Weapons Systems has the upper assembly for you. Whether you’re building a new weapon from the ground up or you’ve just had it with the fussiness of maintaining the upper on your old standby, the PWS MK1 is the long stroke piston AR upper you’ve been waiting for. The PWS MK107 is a complete piston AR upper with a 7.75 inch .223 Wylde Barrel designed to marry up to your SBR or pistol lower with minimum hassle. Changing to a PWS MK1 Diablo upper allows you to have the best of both worlds, the ergonomics and flexibility of the AR platform and the super reliability of the AK-47. Primary Weapons Systems built the MK1 upper on an efficient long stroke AR piston upper design that creates a single-unit by joining a floating piston head and the bolt carrier group with an operating rod. This long piston AR system out-performs both direct impingement systems and short stroke piston systems. The PWS MK107 requires less regular user maintenance and runs longer with few parts failures than either of the systems before it. 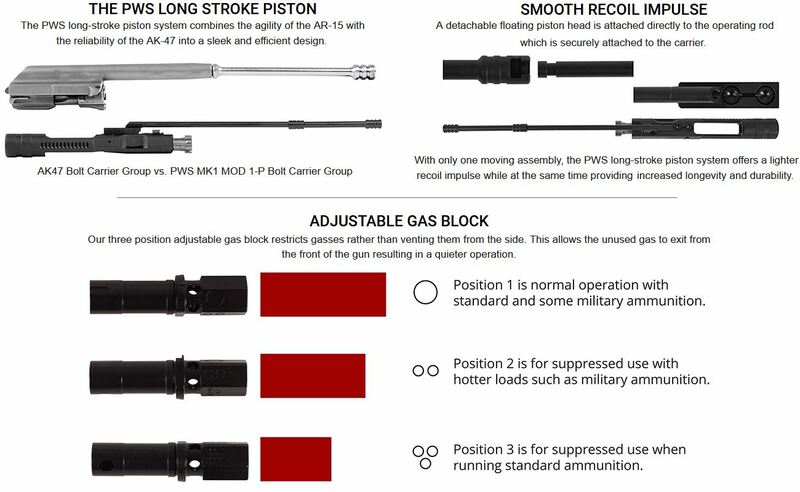 A multi-position adjustable gas block allows the operator to properly tune his weapon for the ammunition and accessories package he’s chosen. The PWS MK107 features next generation lithium embedded salt nitro-carburized treated (FNC LIFE HD) Barrels and Bolt Carrier Groups for ultra-long service life. FNC LIFE treatments don’t just coat steel surfaces like traditional finishes, they alter the outer surface of the piece for a hard wearing finish that won’t chip or oxidize no matter what you put it through. Reduced Carrier Mass allows the MK1 to run less chamber pressure making extraction easier. The MK107 features forged construction giving it a strength that you won’t see in the billet uppers the competition pushes. There are now two different versions of the MK1 Upper. Traditional, “gotta-have-it-the-way-it’s-always-been” guys will love the PWS Mod1 which includes a forward assist. While the PWS Mod 2 loses a little extra weight by paring down the forged upper where the extra mass isn‘t needed and leaving the forward assist behind. The new PWS uppers also simplify the operation of the adjustable gas block to a three position selector with positions for all unsuppressed ammunition, lower powered ammunition with suppression and suppressed normal and high powered ammunition. Whichever PWS MK1 upper you choose you can count on the strength of performance only continued evolution can provide. Primary Weapons Systems, Because It’s Time.